"Paranoid" is a song by American hip hop recording artist Kanye West, released March 24, 2009 as the fourth and final single from his fourth studio album, 808s & Heartbreak (2008). The song was co-produced with Jeff Bhasker and Plain Pat, while co-written by the three along with Consequence and Kid Cudi. The original version of the song, which appears on the album, features English singer-songwriter Mr Hudson, who had recently been signed to West's GOOD Music record label. A remix featuring Rihanna was recorded in the Fall of 2008 and was supposed to be sent to US radio on January 20, 2009 as the album's third single, however, the release was canceled. Eventually, the album version featuring Mr Hudson was sent to radio stations instead on March 24, 2009 as the album's fourth single, shortly after the release of the album's third single, "Amazing". "Amazing" was sent for adds at Rhythmic/Urban radio only, while "Paranoid" was sent to Mainstream Top 40 radio. Another remix, by Kanye West featuring Big Sean and Mr Hudson, was released shortly after the album. "Paranoid" debuted on the Billboard Pop 100 chart at number ninety-six on March 21, 2009. It has since peaked at number sixty-one on the now defunct chart. On April 25, 2009, the song made its debut at number thirty-seven on the Mainstream Top 40 and managed to peak at number thirty-four on May 9. On the issue date of July 20, "Paranoid" debuted on the Australian Singles Chart at number ninety. Rihanna in the "Paranoid" music video. The music video for "Paranoid" was directed by Nabil Elderkin and along with "Amazing," filmed in Hawaii. During a brief interview at the Tribeca Film Festival, West revealed he had cast Rihanna as a lead in the video. West said the following about working with Rihanna: "Yep, she's my Paranoid girl in the video. She’s an amazing talent though. Collaborating with her is always a pleasure!" Island Def Jam chairman L.A. Reid presented a version of the video during an Island Def Jam Event in New York City on May 20, 2009. The music video leaked online on May 27, 2009. The next day, West clarified on his blog that the video was an unfinished version and posted screenshots of the final version. In an interview that took place the following day, Elderkin stated that the leak was merely an early rough cut. In terms of visuals, Elderkin had originally wanted to design the video in an artistic style reminiscent to that of A Clockwork Orange, but West subsequently opted for an abstracted noir concept instead. The video's premise is rooted in fantasy, as it centers around Rihanna's paranoid state of mind causing her to experience a surrealistic dream sequence. Meanwhile, West appears in some scenes in his human form and also his wolf form during the dream sequence. On June 3, West released the finalized version of the music video on his blog, just hours after premiering an unreleased video for "Spaceship." Mr Hudson doesn't appear in the video. Elderkin revealed after West released the video for fellow 808s & Heartbreak track "Coldest Winter" in February 2010, which he directed, that there was originally more Kanye in the video for "Paranoid" and he took him out. At the 2009 MTV Video Music Awards, it was nominated for Best Special Effects in a Video, which was won by "Paparazzi" by Lady Gaga. While showcasing artists signed onto his G.O.O.D. Music imprint, West performed the song live alongside Kid Cudi and Mr Hudson at SXSW on March 21, 2009. West provided a solo performance of the song in Denmark on July 2 while headlining the Orange Stage at the Roskilde Festival. Kanye performed "Paranoid" in Hyde Park, London on July 5 serving as a headliner for the second and final day of the 2009 Wireless Festival. West and Hudson performed the song together again during a concert held at the iTunes Festival in the London Roundhouse on July 7. Information taken from 808s & Heartbreak liner notes. ^ Confusion (2008-12-16). "Kanye West - Paranoid Remix ft. Big Sean and Mr.Hudson". Complex. PigeonsandPlanes. Retrieved 2019-02-06. ^ "Pop 100 – Paranoid". Billboard. Nielsen Business Media, Inc. 2009-03-21. Archived from the original on July 9, 2015. Retrieved 2009-03-21. ^ a b "Pop 100 – Paranoid". Billboard. Nielsen Business Media, Inc. 2009-05-09. Archived from the original on July 9, 2015. Retrieved 2009-05-04. ^ "Pop Music: Top Pop Songs Chart – April 25, 2009". Billboard. Retrieved 2019-02-06. ^ "Kanye West – Paranoid – Chart History". Billboard. Retrieved 2019-02-06. ^ "Australia Singles Chart" (PDF). Pandora. Retrieved 2009-07-20. ^ a b c Rodriguez, Jayson (2009-05-29). "Kanye West's 'Paranoid' Video Director Talks Leak, Casting Rihanna". MTV. MTV Networks. Retrieved 2009-05-30. ^ Uhovski, Valentine (2009-04-23). "Kanye Gives Rihanna a Comeback!". Fashion Week Daily. Fashion Week Daily. Archived from the original on 2009-04-26. Retrieved 2009-04-23. ^ West, Kanye (2009-06-03). 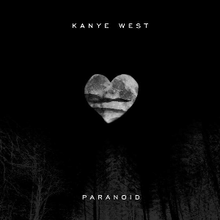 "Kanye West "Paranoid" feat. Rihanna Dir: Nabil". Kanye West Blog. Kanye West/Mascotte Holdings, LLC. Retrieved 2009-06-03. ^ Rodriguez, Jayson (2009-06-03). "Kanye West Posts 'Paranoid' Video, Starring Rihanna, On His Blog". MTV. MTV Networks. Retrieved 2018-10-30. ^ Rodriguez, Jayson (2010-02-24). "Kanye West Didn't Want To Be In 'Coldest Winter' Video". MTV. MTV Networks. Retrieved 2018-10-30. ^ Anital, Tamar (2009-08-04). "VMAs 2009: The Nominations Have Been Announced". MTV. Archived from the original on 2017-09-28. Retrieved 2019-02-03. ^ "2009 MTV Video Music Awards Winners". MTV. Archived from the original on 2010-01-08. Retrieved 2019-02-03. ^ Weingarten, Christopher (2009-03-22). "Kanye West Shows Off Proteges at SXSW Set Featuring Common, Erykah Badu". Rolling Stone. RealNetworks, Inc. Retrieved 2009-03-22. ^ ibn jasper (2009-06-03). "Kanye, Kid Cudi and Mr. Hudson performing "Paranoid" @ SXSW". Vimeo. Vimeo, LLC. Retrieved 2009-06-10. ^ "Kanye West Closes Wireless Festival With Crystal-themed Show". NME. IPC Media. 2009-07-06. Retrieved 2009-07-06. ^ Crerar, Simon (2009-07-08). "Mr Hudson goes Supernova with Kanye". Times Online. Times Newspapers Ltd. Retrieved 2009-07-22. ^ "Paranoid (Starring Rihanna EP) by Kanye West". Amazon.com. Amazon Music. Retrieved 2019-02-04. ^ "Australian-charts.com – Kanye West feat. Mr Hudson – Paranoid". ARIA Top 50 Singles. Retrieved December 28, 2014. ^ "Ultratop.be – Kanye West feat. Mr Hudson – Paranoid" (in Dutch). Ultratip. Retrieved December 28, 2014. ^ "Ultratop.be – Kanye West feat. Mr Hudson – Paranoid" (in French). Ultratip. Retrieved December 28, 2014. ^ "Kanye West – Paranoid Media Forest". Israeli Airplay Chart. Media Forest. Retrieved December 28, 2014. ^ "Kanye West Chart History (Bubbling Under Hot 100)". Billboard. Retrieved December 28, 2014. ^ "Kanye West Chart History (Pop Songs)". Billboard. Retrieved December 26, 2014. ^ "Kanye West Chart History (Rhythmic)". Billboard. Retrieved December 28, 2014. "Love Never Dies (Back for the First Time)"
This page was last edited on 5 April 2019, at 07:12 (UTC).